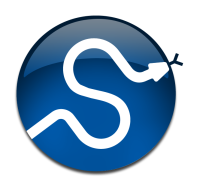 The scipy.optimize package provides several commonly used optimization algorithms. An detailed listing is available: scipy.optimize (can also be found by help(scipy.optimize)). Unconstrained and constrained minimization and least-squares algorithms (e.g., fmin: Nelder-Mead simplex, fmin_bfgs: BFGS, fmin_ncg: Newton Conjugate Gradient, leastsq: Levenberg-Marquardt, fmin_cobyla: COBYLA). Below, several examples demonstrate their basic usage. Another optimization algorithm that needs only function calls to find the minimum is Powell’s method available as fmin_powell. In order to converge more quickly to the solution, this routine uses the gradient of the objective function. 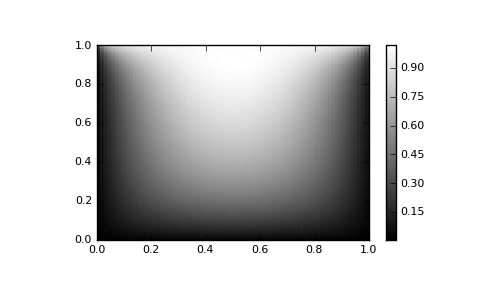 If the gradient is not given by the user, then it is estimated using first-differences. The Broyden-Fletcher-Goldfarb-Shanno (BFGS) method typically requires fewer function calls than the simplex algorithm even when the gradient must be estimated. The calling signature for the BFGS minimization algorithm is similar to fmin with the addition of the fprime argument. An example usage of fmin_bfgs is shown in the following example which minimizes the Rosenbrock function. The inverse of the Hessian is evaluted using the conjugate-gradient method. An example of employing this method to minimizing the Rosenbrock function is given below. To take full advantage of the NewtonCG method, a function which computes the Hessian must be provided. The Hessian matrix itself does not need to be constructed, only a vector which is the product of the Hessian with an arbitrary vector needs to be available to the minimization routine. As a result, the user can provide either a function to compute the Hessian matrix, or a function to compute the product of the Hessian with an arbitrary vector. For larger minimization problems, storing the entire Hessian matrix can consume considerable time and memory. The Newton-CG algorithm only needs the product of the Hessian times an arbitrary vector. As a result, the user can supply code to compute this product rather than the full Hessian by setting the fhess_p keyword to the desired function. The fhess_p function should take the minimization vector as the first argument and the arbitrary vector as the second argument. Any extra arguments passed to the function to be minimized will also be passed to this function. If possible, using Newton-CG with the hessian product option is probably the fastest way to minimize the function. An objective function to pass to any of the previous minization algorithms to obtain a least-squares fit is. The leastsq algorithm performs this squaring and summing of the residuals automatically. It takes as an input argument the vector function and returns the value of which minimizes directly. The user is also encouraged to provide the Jacobian matrix of the function (with derivatives down the columns or across the rows). If the Jacobian is not provided, it is estimated. 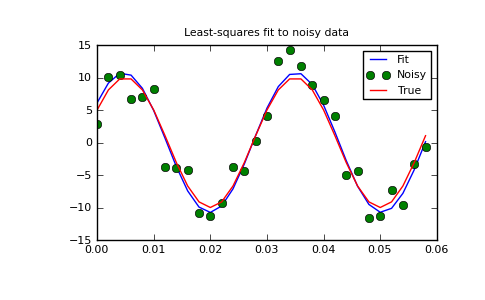 This module implements the Sequential Least SQuares Programming optimization algorithm (SLSQP). The following script shows examples for how constraints can be specified. function f(x) = 2*x*y + 2*x - x**2 - 2*y**2, which has a maximum at x=2,y=1. d represents y in the following equation. print "Unbounded optimization. Derivatives approximated." print "Elapsed time:", 1000*(time()-t0), "ms"
print "Unbounded optimization. Derivatives provided." print "Bound optimization. Derivatives approximated." print "Bound optimization (equality constraints). Derivatives provided." print "Bound optimization (equality and inequality constraints)." print "Derivatives provided via functions." print "Constraint jacobians provided via functions"
Often only the minimum of a scalar function is needed (a scalar function is one that takes a scalar as input and returns a scalar output). In these circumstances, other optimization techniques have been developed that can work faster. There are actually two methods that can be used to minimize a scalar function (brent and golden), but golden is included only for academic purposes and should rarely be used. The brent method uses Brent’s algorithm for locating a minimum. Optimally a bracket should be given which contains the minimum desired. A bracket is a triple such that and . If this is not given, then alternatively two starting points can be chosen and a bracket will be found from these points using a simple marching algorithm. If these two starting points are not provided 0 and 1 will be used (this may not be the right choice for your function and result in an unexpected minimum being returned). Thus far all of the minimization routines described have been unconstrained minimization routines. Very often, however, there are constraints that can be placed on the solution space before minimization occurs. The fminbound function is an example of a constrained minimization procedure that provides a rudimentary interval constraint for scalar functions. The interval constraint allows the minimization to occur only between two fixed endpoints. The results are and . If one has a single-variable equation, there are four different root finder algorithms that can be tried. Each of these root finding algorithms requires the endpoints of an interval where a root is suspected (because the function changes signs). In general brentq is the best choice, but the other methods may be useful in certain circumstances or for academic purposes. A problem closely related to finding the zeros of a function is the problem of finding a fixed-point of a function. A fixed point of a function is the point at which evaluation of the function returns the point: Clearly the fixed point of is the root of Equivalently, the root of is the fixed_point of The routine fixed_point provides a simple iterative method using Aitkens sequence acceleration to estimate the fixed point of given a starting point. The fsolve function cannot deal with a very large number of variables (N), as it needs to calculate and invert a dense N x N Jacobian matrix on every Newton step. This becomes rather inefficent when N grows. with the boundary condition on the upper edge and elsewhere on the boundary of the square. This can be done by approximating the continuous function P by its values on a grid, , with a small grid spacing h. The derivatives and integrals can then be approximated; for instance . The problem is then equivalent to finding the root of some function residual(P), where P is a vector of length . Now, because can be large, fsolve will take a long time to solve this problem. The solution can however be found using one of the large-scale solvers in scipy.optimize, for example newton_krylov, broyden2, or anderson. These use what is known as the inexact Newton method, which instead of computing the Jacobian matrix exactly, forms an approximation for it. If you have an approximation for the inverse matrix , you can use it for preconditioning the linear inversion problem. The idea is that instead of solving one solves : since matrix is “closer” to the identity matrix than is, the equation should be easier for the Krylov method to deal with. The matrix M can be passed to newton_krylov as the inner_M parameter. It can be a (sparse) matrix or a scipy.sparse.linalg.LinearOperator instance. The matrix of the Jacobian corresponding to the integral is more difficult to calculate, and since all of it entries are nonzero, it will be difficult to invert. on the other hand is a relatively simple matrix, and can be inverted by scipy.sparse.linalg.splu (or the inverse can be approximated by scipy.sparse.linalg.spilu). So we are content to take and hope for the best. In the example below, we use the preconditioner . Using a preconditioner reduced the number of evaluations of the residual function by a factor of 4. For problems where the residual is expensive to compute, good preconditioning can be crucial — it can even decide whether the problem is solvable in practice or not. Preconditioning is an art, science, and industry. Here, we were lucky in making a simple choice that worked reasonably well, but there is a lot more depth to this topic than is shown here. [KK] D.A. Knoll and D.E. Keyes, “Jacobian-free Newton-Krylov methods”, J. Comp. Phys. 193, 357 (2003).